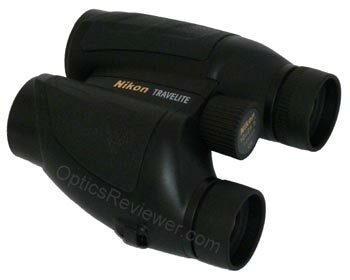 Nikon Travelite VI Binoculars - Classy Compact or Not? The Travelite VI from Nikon: Does it Uphold the Travelite Tradition? Between the time we had ordered our new Nikon 10X25 Travelite VI and the time it arrived, we found a number of things slowing us down so we weren't able to get out for some real life use right away. When we did get a chance, though, we found it to be a solid performer in all respects except one. You've probably guessed that our person took a boat ride for a view of the rookery with the Nikon Travelite binoculars in hand. The accompanying picture is so you can see what it is like. They're amazing creatures, aren't they? The main feature of compact binoculars is their portability. They're both lightweight and small and able to either be comfortably carried around the neck or in a reasonably sized handbag or backpack without running an undue risk of damage. The Travelite VI fills compactness and portability requirements nicely. 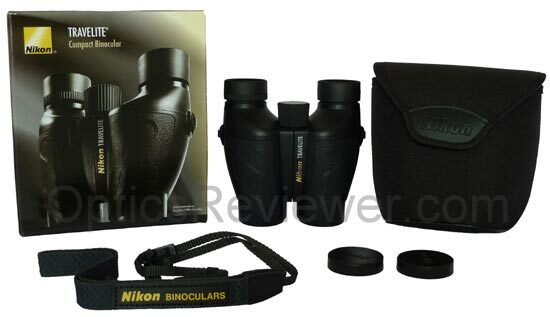 Nikon is one of the first binocular manufacturers, if not the very first, to incorporate the extraordinarily tough carbon fiber material into its housing for the Travelite binoculars. (With even car makers embracing carbon fiber for tough, lightweight fuel efficiency, one wonders why there aren't more binoculars made this way!) To compare weights, the 10X25 Travelite weighs 3.4oz (96.4g) less than the polycarbonate Nikon ProStaff of the same configuration. The Travelite VI chassis is made of polycarbonate to provide the basis for the binocular's hinge and focusing mechanism a tough material on which to fasten. (We noticed some retailers saying that the Travelite VI had a metal frame/chassis and we went to our contact at Nikon to ensure the accuracy of the information we're giving you!) 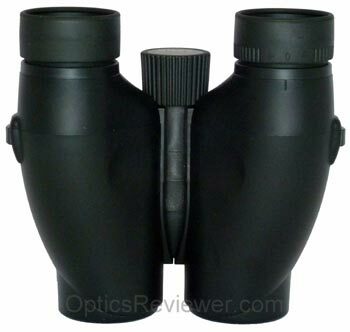 This lightweight, but tough, frame adds hardly any weight to the binocular, with the weight for the three configurations running between 9.4-9.7oz (265-275g). That light of a weight factor just cries out for someone to take it backpacking or on a trip, doesn't it?!? Is it too light to be able to hold steady? We were a bit apprehensive about this, but it seemed to do quite nicely in our average-sized hands. The Travelites have traditionally provided a very comfortable fit in the hand, much like their predecessor, Nikon's Diplomat model in the 1990s. Nikon's historians tell us that the predecessor Travelite V series was introduced in 1999, thus enjoying a long reign of popularity until replaced by the Travelite VI in 2010. Although we've not reviewed the Travelite V, we understand from Nikon that the changes between the V and VI models are to "enhance ergonomics" on the outside. The optics remain unchanged. One of the external differences is the rubber armoring which more or less encased the Travelite V, but was pared back to cover just the top of the binocular where the fingers lay on the Travelite VI. If you decide you want a Travelite, it makes sense to us to simply look for a good deal on either model. The reverse Porro prism design, where the eyepieces are further apart than the objective lenses instead of the other way around, is a popular one for compact binoculars. 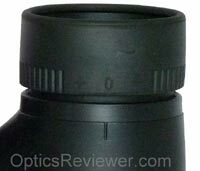 While reverse Porro prism designs won't usually fit comfortably in a shirt pocket, they come pretty close, sometimes have excellent optics and carry a significantly lower price tag than comparable roof prism "pocket binoculars." It's pretty difficult to waterproof a compact reverse Porro design binocular and still have it easy to use. The Travelite binoculars are not waterproof, but this shouldn't stand in your way of enjoying them. They're so small that it's not difficult at all to carry along a plastic bag to slip them into should you encounter damp conditions. Most sandwich bags with a zipper-type closure seem to do just fine and still have room for a small notepad. If, however, they should become damp and you note internal fogging, you'll want to dry them as reasonably quickly as possible. If you're at home with a gas oven equipped with a pilot light, it's an easy matter to let them rest in the comfortably warm oven while they dry out. If that's not an option, slipping them into a plastic bag or larger glass jar with dry rice to absorb the moisture (much as some folks put rice into salt shakers) or, if you have it, toss in a couple of medium-sized packets of desiccant or more will help. 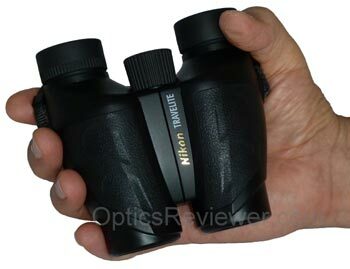 The eye relief on the 10X25 and 12X25 Nikon Travelite binoculars is a scant 11.1mm. It's fine for use with the naked eye, but barely or not quite enough for a fair number of eyeglass wearers. It's better with the 8X25 configuration's 14.0mm — much better for many eyeglass wearers. Not having enough eye relief can take a lot of the enjoyment out of using an otherwise good binocular. If you use eyeglasses, you'll want to check on the amount of eye relief you're comfortable with before ordering. 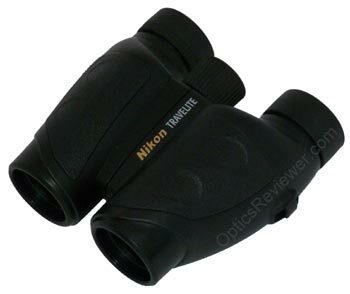 The Nikon Travelite binoculars provide rubber fold down eyecups. We used to be a little nervous about folding these down as a binocular ages. Our thinking was that the rubber gets stiff with age and is likely to crack or tear as it stretched and flexed. Rubber fold down eyecups have been used for years, though, and you'd think we would have heard it if there was a general outcry against them. You may have had a larger Porro prism design binocular in the past and noted how the eyepieces moved back and forth as you adjusted the focus. This is the typical design approach and has worked well in larger configurations for years. The approached used by compact Porro prism designers for a number of years has been to keep the eyepieces still and move the objectives back and forth to achieve the focus. The designers chose this classic approach when giving life to the Travelite concept. It's an excellent, time-tested approach and likely to give years of good service. The focus wheel of our test unit turns clockwise for a single full revolution to go from close focus to infinity. We're delighted with the focusing afforded by this design — Nikon Travelite binoculars got it right! The focus wheel itself is an inch (2.5cm) in diameter and makes for achieving a fine focus quickly and easily. A person pretty much has to accept that as the magnification power goes up, all other things remaining the same, the field of view decreases. The 7X26 Bushnell has an excellent field of view largely because it combines the lower magnification (7X) with an objective lens diameter equal to or slightly larger than most compacts (26mm). Our 10X25 test unit has a decent angular field of view at 5° or 285ft/87m at 1,000yds/m. 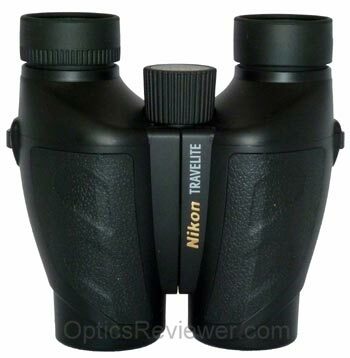 If we had chosen the Nikon Travelite 8X25 binoculars' optics, our field of view would be correspondingly larger at 5.6° for 322ft/98m at 1,000yds/m. Let's quickly consider the 12X25 for comparison before we get too many numbers running together in our head! The 12X25 has an angular field of view of 4.2° or 240ft/73m at 1,000yds/m — it's actually a fairly limited viewing area for the 12X25 user. If you're looking for magnification power in a small binocular, you'll be better served by stopping at 10X. Why is 10X better than 12X? There are three good reasons. To start with, tiny natural hand tremors or even shallow breathing with 12X magnification and only a 25mm objective will make it difficult to see details. To put it in more every-day terms, if you were to try to read a street sign or car license number at a significant distance with 8X, 10X, and 12X magnification, it would be the most difficult with the 12X because of those natural movements. The second reason is because the restriction of light getting to your eyes makes your view significantly darker at 12X and that means fewer observable details, contrast, and clarity. Finally, the very small field of view will make it much more difficult to locate a moving view, whether it's a moving animal, plane or person. What's the center field focus? It's the area in the middle of the field of view where the curvature of the lenses allows the details to be sharply defined. It's what we sometimes call the sweet spot in the field of view. As you get closer to the periphery of the view with the majority of binoculars, the details tend to soften slowly until you recognize that they're generally getting blurred. The sweet spot for our 10X25 test Travelite was of particular interest to us because Nikon aspherical lenses have historically provided particularly nice, sharp resolution of details in the center field focus, but performance declines significantly outside of that area. We wanted to see how large that sweet spot was and how much of the field of view was actually usable. When our light little Nikon Travelite VI binocular was used for looking up and down the Tennessee River, there seemed to be an obvious, fuzzy ring around the periphery of the view. While our team member didn't have test charts or graphs along, it was estimated that the "fuzzy ring" took up the last 10&percnt; of the field of view's radius. But as Mclellan Island was approached (if you skipped our first Travelite experience at the top of this page this won't make sense) and the binoculars were focused on the trees and rookery, the fuzzy peripheral ring was not as evident/apparent! It was understandably nice not be distracted by the fuzzy ring, but it raised the question why it would be so evident in one situation and not in another. Experimenting after the trip was completed indicated that when we looked at lightly colored areas, the blurred ring was much more obvious than when looking at varied or darker views. This is the one item that we felt our Travelite didn't live up to performance expectations. It seems to us that if you know about it ahead of time, however, the blurred ring isn't likely to be as much of a distraction as it was for us initially. When testing the resolution of details in the Travelite VI 10X25's overall field of view, we found the details to be sharply defined and well contrasted to about 60&percnt; of the field of view's radius as measured from the center. From that point the details started to soften as one looked nearer to the field of view's edge. Images viewed with our test model lost usable details at 90-92&percnt; of the radius. Those who are susceptible to or can more readily see the "globe" or "rolling ball" effect will be happy to know that Nikon engineers a very small amount of pincushion distortion into the Travelites to avoid the rolling ball effect. What does this mean? It means that the Nikon Travelite binoculars provide excellent resolution of details within a generously sized sweet spot. We believe this is due in no small part to the aspherical lenses that Nikon pioneered in 1993 with its compact Diplomat binocular — at least becoming the first manufacturer to advertise the use of such lenses. Nikon says that our test 10X25 Travelite has a 2.5mm exit pupil and that seems about right. While it's a good size for use in daylight, it's toward the small size for passing light through to our eyes under low light conditions. The 8X25's exit pupil of 3.1mm would be better and the 12X25's 2.1mm significantly worse as far as transmitting light is concerned. How Close Could We Get the Focus? Nikon specifications indicate the 10X25 Travelite configuration will have a close focus of 9.8ft (3.0m). We measured our test model's close focus at 7.5ft (2.3m) and, at least for our instrument, within the 8.0ft (2.4m) we propose for bird watching binoculars. We were delighted with the Travelite VI's control of chromatic aberration at its price point. While not perfect, the aspherical lenses again seemed to come into play and remarkably reduce chromatic aberration in our test model. The Travelite binocular we tested seemed to have a slight bias toward blues, although it doesn't seem likely that it would be noticed by the average user. We mention it only for those who, like us, are interested in those sorts of things! 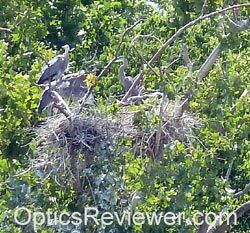 How do Nikon Travelite Binoculars Perform in Low Light? Compact binoculars are not typically purchased with the idea that they'll do particularly well under low light conditions. One compact model that does significantly better than most reverse Porro prism designs is Bushnell's. Having said that, we can look at the Travelites specifically and see what affects their low-light performance and how to maximize it. Travelites' optics are multi-coated, meaning that multiple anti-reflective coatings have been applied to one or more surfaces of one or more lenses. By definition, this means that some surfaces may not have an anti-reflective coat applied and, consequently, they may not provide low light images as clear, crisp, and contrasted as fully multi-coated optics would. While anti-reflective coatings are significant for the amount of light transmitted to your eyes, they're not the only factor. Other major elements include the size of the exit pupil and the quality of the glass used to make the prism. The Travelite VI's prism is made of BaK-4 glass — a good, high-quality optical glass. All other things being equal, its prisms would not be an inhibiting factor for a light/bright image in low light. The size of the exit pupil is quite significant. We can maximize the Travelite VI's low-light performance by using the configuration with the largest exit pupil that's practical for our intended use. For example, if our intended use was mainly for daylight and extended distances, we wouldn't mind trading low-light viewing ability for the higher magnification. If we wanted to maximize low-light performance, we would choose the Nikon Travelite 8X25 binoculars' optics. How did the Travelite VI do in Strong Light? As with using compact binoculars for viewing in low light, most of us don't buy compact binoculars with the expectation of using them outperforming larger binoculars under strong light conditions. What do we mean by "strong light"? It would include looking against the sun (NEVER directly at the sun, since it can easily damage both our eyes and binocular!) and having sunlight obliquely reflected from a surface such as glass or water/snow/ice. The reason for this is because of the compact's short barrels not providing the amount of room needed for a strong system to overcome the light being bounced about inside the barrels. We felt our test unit turned in a good performance in dealing with strong or reflected light at its price point. It wasn't remarkably above average and it wasn't below. It was good and we enjoyed using it. Those who know us will recall that we prefer a diopter adjustment that doesn't change its setting easily after it's set right for our eyes. The Travelite's diopter adjusts by turning the right eyepiece/eyecup instead of using a separate ring adjuster. It's a nice way of contributing to a small, compact design. The larger reason we like it for is because it has click stops that help to prevent turning it when you don't intend to do so. Invariably people want to know where binoculars are made. The box our 10X25 Nikon Travelite binoculars came in said they were made in an optical manufacturing plant in China. It looks to us as though Nikon got Nikon quality in the Travelite we tested. One thing we can't seem to pass by in a review for instruments like Nikon Travelite binoculars is the depth of view provided by the Porro prism. That's the distance between the nearest object you can see clearly at a given focus setting and the object at the furthest distance which you can see clearly. Porro prisms give a delightful, three-dimensional view that not many roof prism designs can duplicate. From a practical perspective it means that you can see more without having to adjust or fine-tune your focus. From a simple enjoyment aspect, it just means they provide a great view. What Comes With the Travelite VI? We loved saving money with the Travelite VI binoculars and we consider that the money still in our pocket "came with them"! In view of that, we didn't expect a lot of extras in the box. In addition, though, we have a slim, lightly padded carrying case made of a nylon- or polyester-type material. It has a sturdy nylon web belt loop sewn on the back. With the extra-light weight of the Travelite binoculars, it seems like a good, working arrangement. There are two individual caps provided to fit over the top of the eyepieces. There isn't any provision for attaching them to the neck strap, although some would like them to. It wouldn't make sense, to our way of thinking, to add the extra plastic to form a bridge between the two caps and then to have them attach to the neck strap when they've gone to so much effort to trim any unnecessary weight. Due to the compact design, we couldn't figure out how to make covers for the objective lenses that would fit and stay on. Apparently the folks at Nikon couldn't either, since there aren't any included. The neck strap provided with the Travelites reflects their light weight. It appears to be made of nylon webbing and is about a half inch (1.3cm) wide. We felt it was comfortable and like the fact that it is compact and easy to fold into the carrying case for travel, backpacking, or just carrying them (in the case) using the belt loop on a hike. We've found Amazon to have the lowest prices on the internet and that's where make the majority of our purchases. These links will take you directly to the Nikon Travelite VI selections available at Amazon.com (USA) and Amazon.co.uk . What activities would we especially recommend them for? Certainly travelers and backpackers/hikers/bicyclists will love these. Bird watchers needing a quick fix while out and about will appreciate them. They'll be great for concert attendance as well as in many museums. Theater and opera goers will want the 8X25 for its wider field of view (or the Bushnell Custom's even wider view). They fit easily into a car's glove box, but be careful of summertime heat. Photographers will value Travelites. Some hunters may find that weight and space considerations outweigh optical requirements on occasion and try Travelites. We're compact binocular enthusiasts. 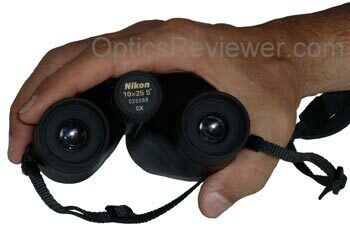 Our first, good-quality binocular was the Nikon Diplomat and we used it for nearly everything. We still have it and still use it, too! We would be absolutely lost without a binocular or monocular nearby. What can you do if something happens to your Nikon binoculars?